Orange County is the third most populous county in California, with more than 3 million people and the 6th most populous in the US. 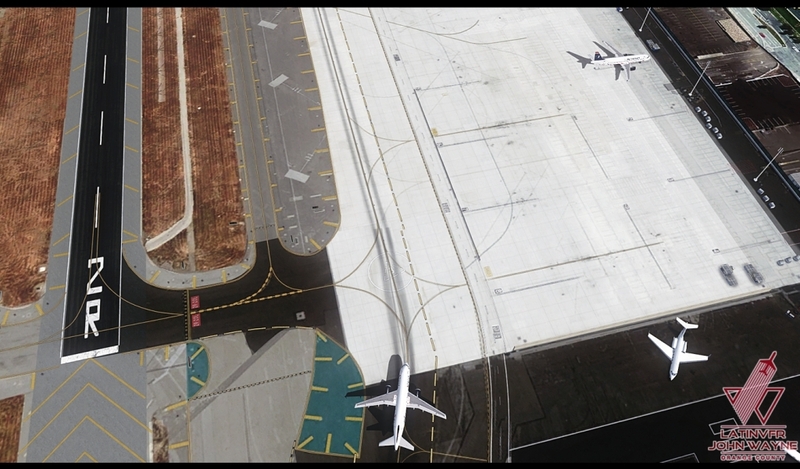 Its airport John Wayne International airport handles almost 10 million passengers per year, making it the second most important in the region after LAX. 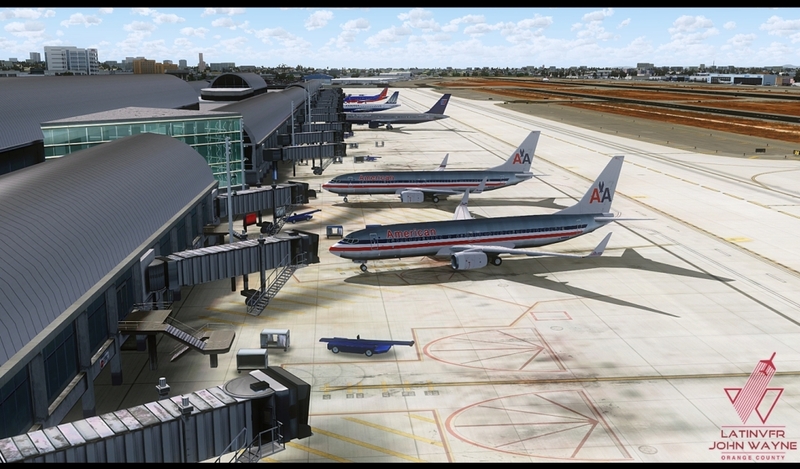 KSNA (SNA) John Wayne International airport completely modeled with significant attention to detail. Skyscrapers with land able helipads. 14 square miles of optional photo scenery with hundreds of hand placed autogen.  Ability to remove and add optional scenery for compatibility with other addons. 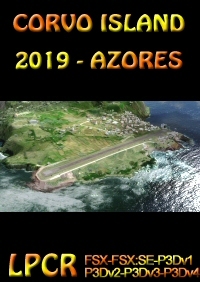 FSX, FS2004, Prepar3Dv1 and Prepar3Dv2 support. 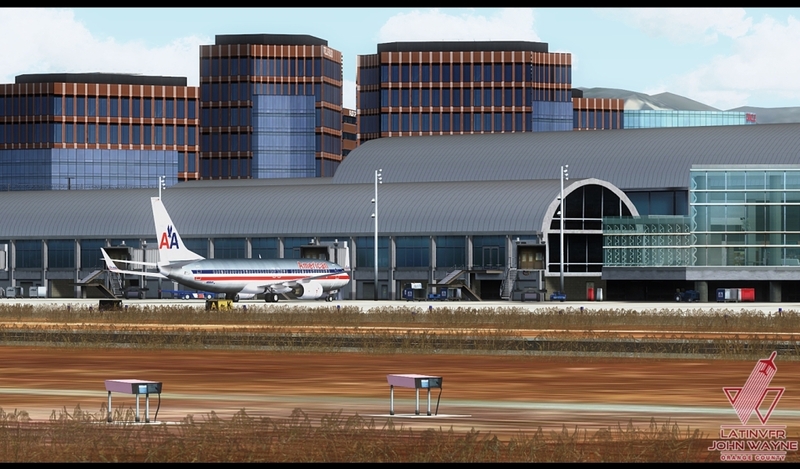 A very nice scenery/airport, good frame rates, way better than miami v2 in performance. I love the surrounding they made too. I got it during sales for very cheap and I didnt regret it. 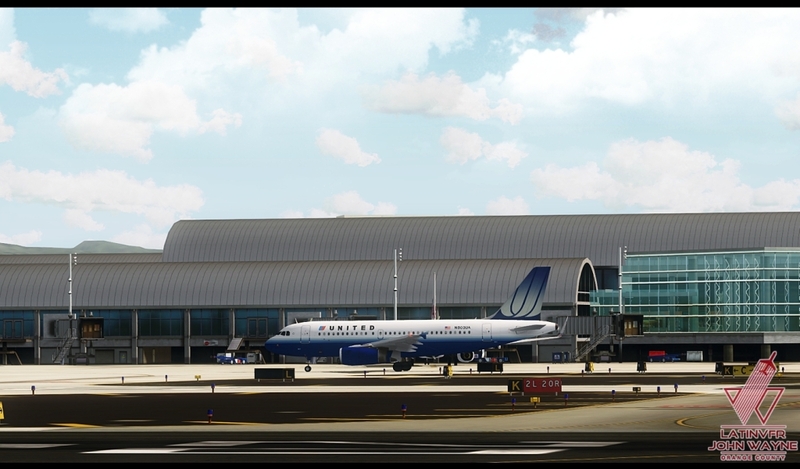 KSNA - John Wayne Airport, Anaheim, CA recently updated for P3D version 3.x is another great job by LATINVFR! I love their work, particularly this airport, which I fly out of a great deal. 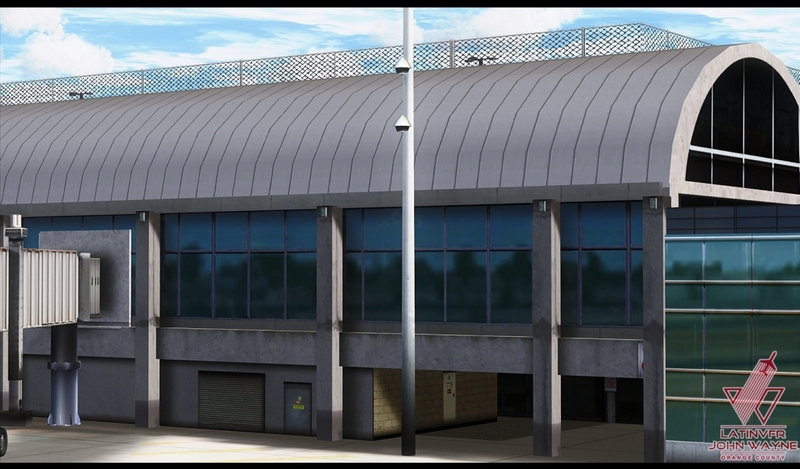 The terminals have a distinctive curved roof design, and you can even see reflections in the terminal windows! A terrific job and at a very reasonable price point! Small 'quirks' I'm sure they will resolve soon, the taxiway signs on taxiway A (the east side where the big birds are) extend too far into the actual taxiway and should be moved more towards the grass in the center and out of the way of taxiing aircraft. Also, as you approach the airport, the buildings off the airport grounds but just beside it are 'flattened' in other words they don't stand up as they should, they appear to be 'orthographic' which is a buzz killer when you are on short final. I noticed this problem flying Prepar3D version 3.1 with ORBX Global, Vector, and Southern California all installed updated and active. 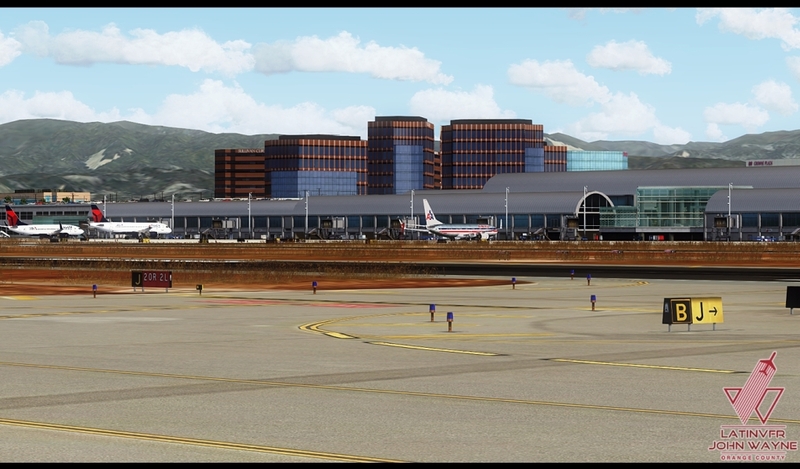 If I untick the LatinVFR airport in P3D scenery library, then the flattened buildings issue goes away. 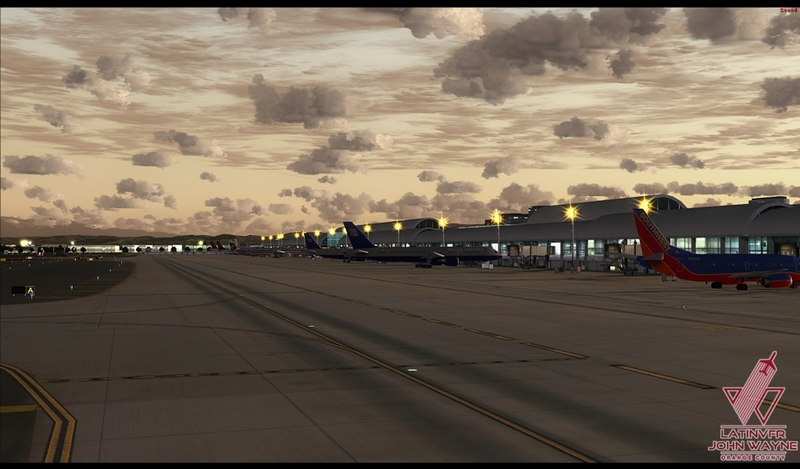 Still and all, I love the airport and would not fly P3Dv3 without it! This airport is gorgeous! The detail is fantastic and it all comes to you in HD! This is also a very busy airport with commercial aircraft in and out constantly. Just awesome! Worth it! Fantastic scenery. 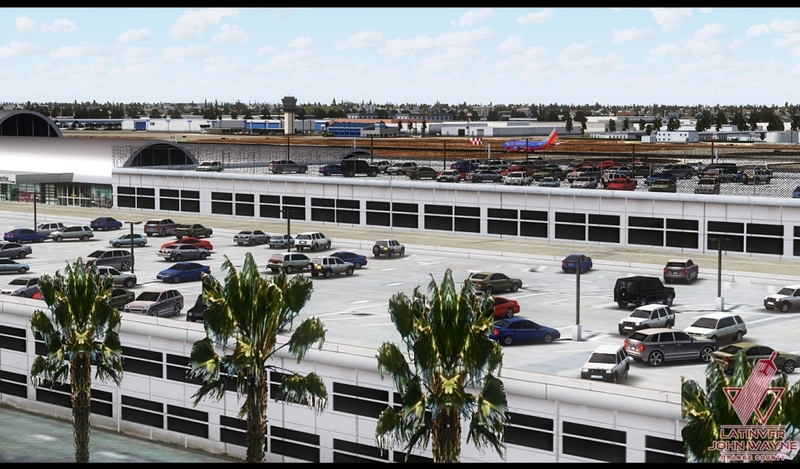 Smooth frame rates, gates are depicted clearly, even the area around the airport is modeled. Great job guys! But I will be upset if LatinVFR issues an update next week and charges me for it. Really Amazing, Better than San Diego. Much better optimization. 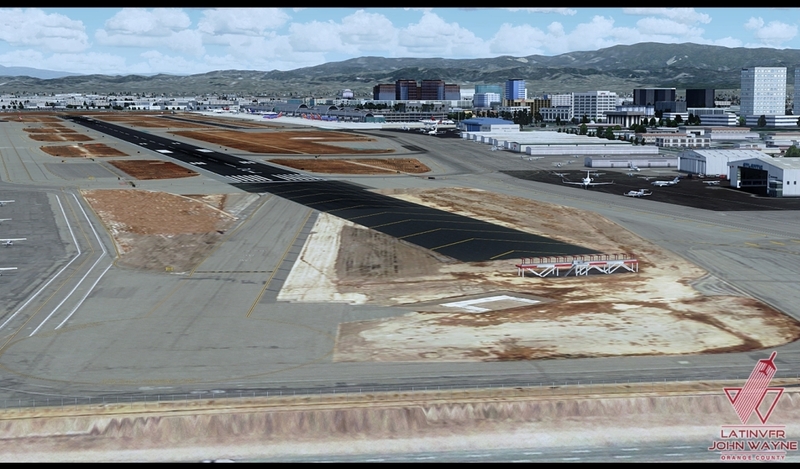 Large area around the airport is photo real, lots of off building airports provide better immersion. Airport looks great. High res textures look awesome. Great performance. FSX was always good, but with the 5 or 6 front running developers we have these days it truly is as real as it gets. 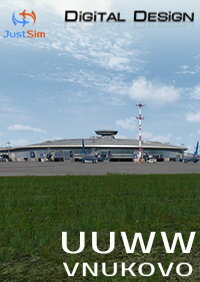 Bought this airport on Simmarket today for FS2004. This is an absolute masterpiece, gorgeous picture quality and no framerate problems. Highly recommended. 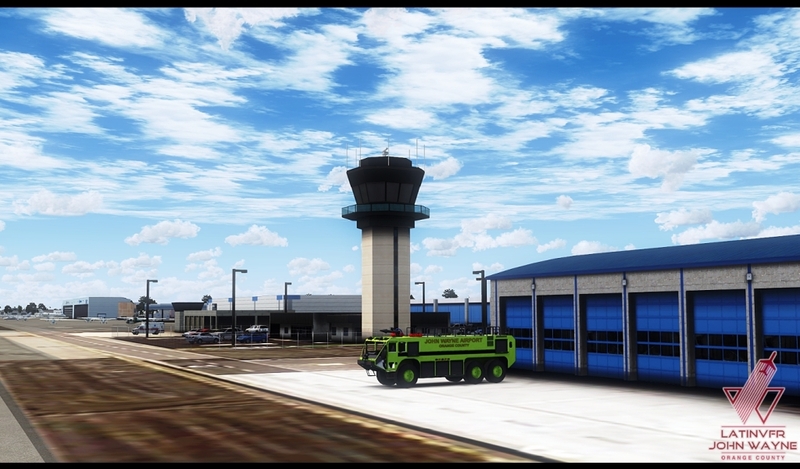 Thank you LatinVFR for making this airport for FS2004. GREAT Product, Even Greater Support. Simulates Orange county exactly. Another Classic from LATIN VFR. One of the best sceneries on the market. The ground work LatinVFR did here is simply amazing, taking into account a very good scenery performance. Hundrieds of custom ground signs, all with a realistic dirt, look simply marvelous. 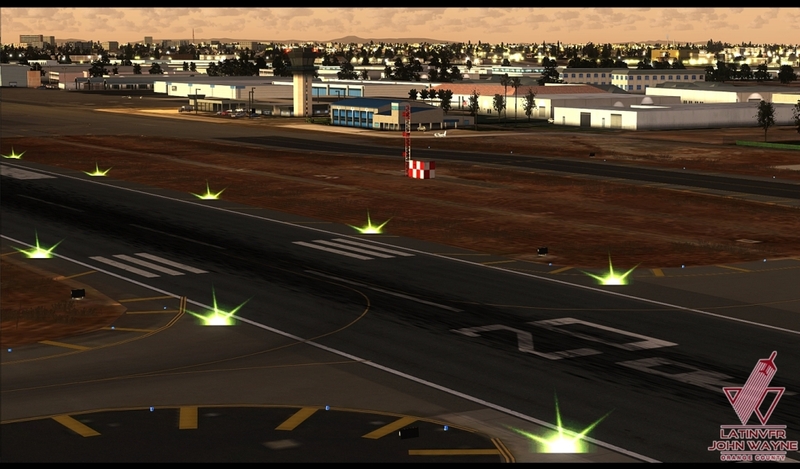 Lighting of the airport is very realistic as well - there are even animated holding point lights (2 types). The terminal is designed in a very advanced way, including interiors in some parts of it. The version with static AC features many GA and BJ aircraft standing on parking positions. There is a custom mesh designed for the nearby roads. 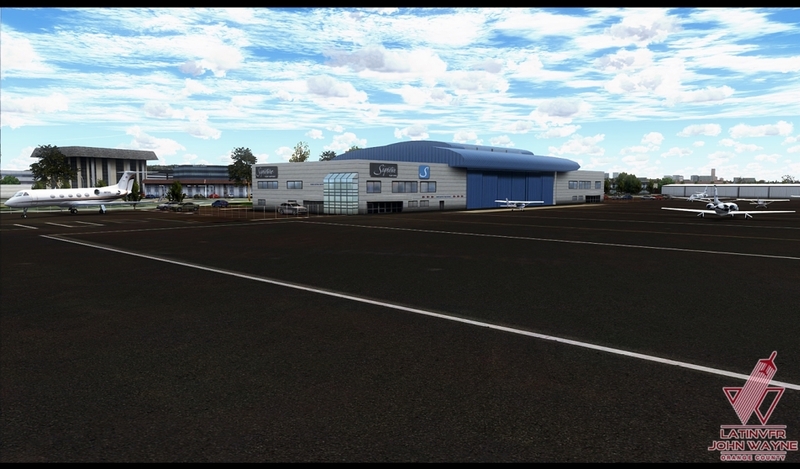 The scenery area is also very large, especially on runway headings; all with custom buildings mixed with well-placed autogen buildings. There are tones of custom airport vehicles. 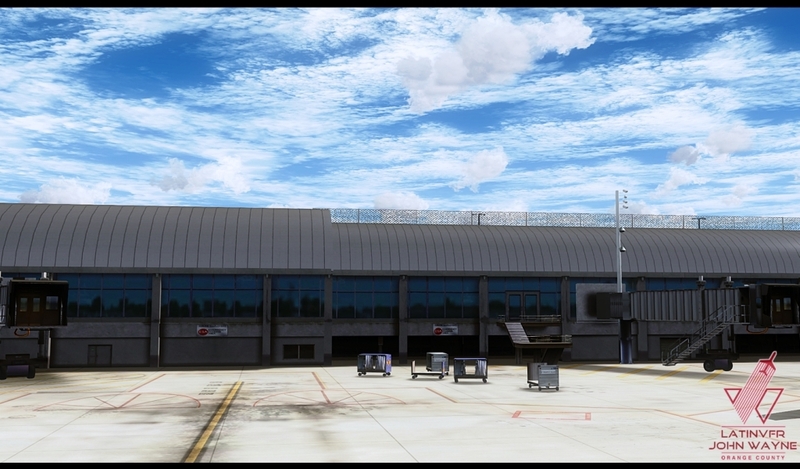 The level of detail here is really gorgeous, every little airport structure is modelled in a quality way. There is also a configuration app that allows you to switch on/off certain elements of the scenery. 5* are fully deserved by this product. , good frame rates, way better than miami v2 in performance. I love the surrounding they made too. I got it during sales for very cheap and I didnt regret it. 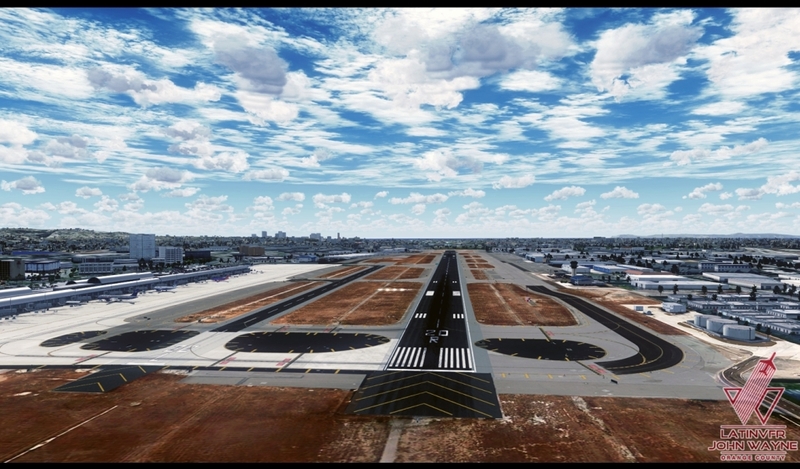 KSNA - John Wayne Airport, Anaheim, CA recently updated for P3D version 3.x is another great job by LATINVFR! I love their work, particularly this airport, which I fly out of a great deal. 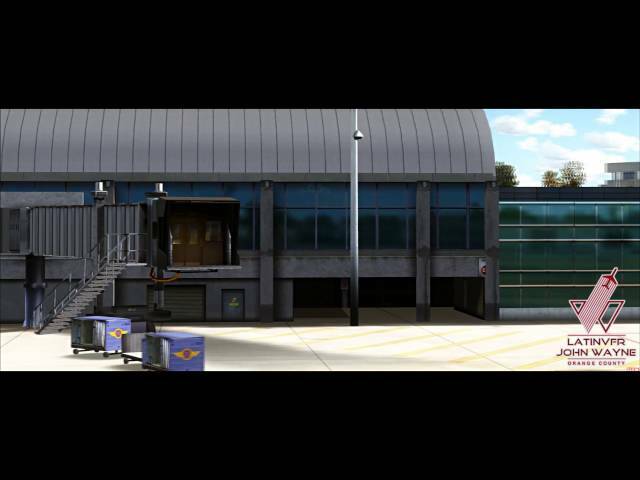 The terminals have a distinctive curved roof design, and you can even see reflections in the terminal windows! A terrific job and at a very reasonable price point! Small 'quirks' I'm sure they will resolve soon, the taxiway signs on taxiway A (the east side where the big birds are) extend too far into the actual taxiway and should be moved more towards the grass in the center and out of the way of taxiing aircraft. Also, as you approach the airport, the buildings off the airport grounds but just beside it are 'flattened' in other words they don't stand up as they should, they appear to be 'orthographic' which is a buzz killer when you are on short final. I noticed this problem flying Prepar3D version 3.1 with ORBX Global, Vector, and Southern California all installed updated and active. 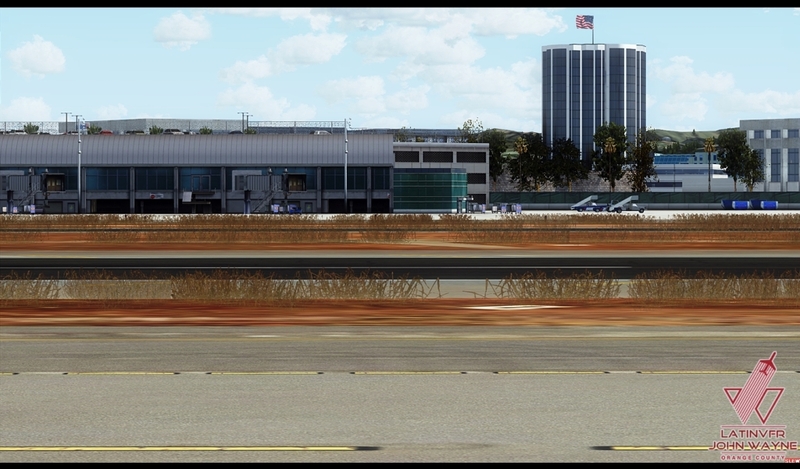 If I untick the LatinVFR airport in P3D scenery library, then the flattened buildings issue goes away. 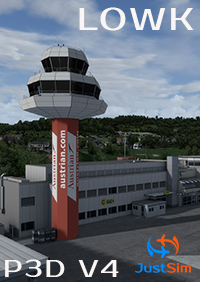 So hoping LatinVFR will take note and release a fix for this small but important 'wish' item :D Still and all, I love the airport and would not fly P3Dv3 without it! Fantastic scenery. 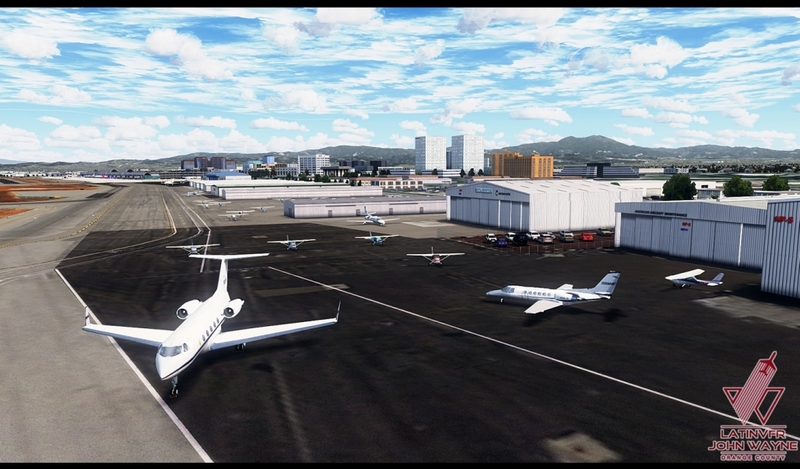 Smooth frame rates, gates are depicted clearly, even the area around the airport is modeled. Great job guys! But I will be upset if LatinVFR issues an update next week and charges me for it.